Have you booked a trip to Cuba? Are you intrigued to visit now that it’s become just slightly easier to do so? I’d love to see everything before any major real estate development takes place, but I don’t have a trip planned at this point. In the meantime, I’ve been reading a review copy I received of the new book Cuba! : Recipes and Stories from the Cuban Kitchen . I’m fascinated with the fincas, or farms, where land that’s less than ideal for growing food is being slowly turned into productive areas with traditional, earth-friendly techniques. Soil is being revived with crops that return nutrients to the ground, and only natural fertilizers are used. The stories in the book are based on just a few visits to Cuba by the authors. The recipes cover Cuban basics, snacks, sandwiches, stews, meat dishes, seafood, sweets, and drinks. There are a few that I wasn’t sure are entirely authentic, classic, Cuban dishes like the Caribbean Black Bean Burger and the Mojito Cake. I did love seeing the Jibarito, though, and I can’t wait to make that again soon. I always seem to be drawn to recipes with plantains. This time, the Pureed Plantain Soup got my attention because it’s a texture I’d never tried with plantains. I love making pureed soups due to the ease of chopping the vegetables roughly since perfect size and shape doesn’t matter as much. 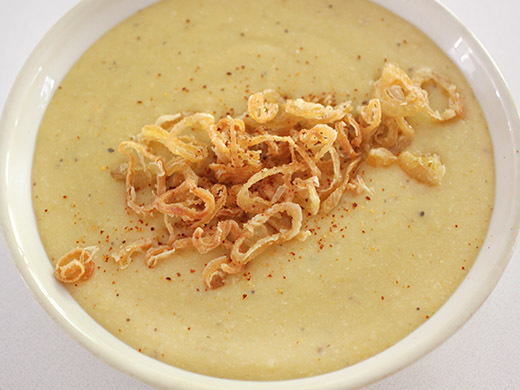 The soup was started by sweating chopped onion and garlic. 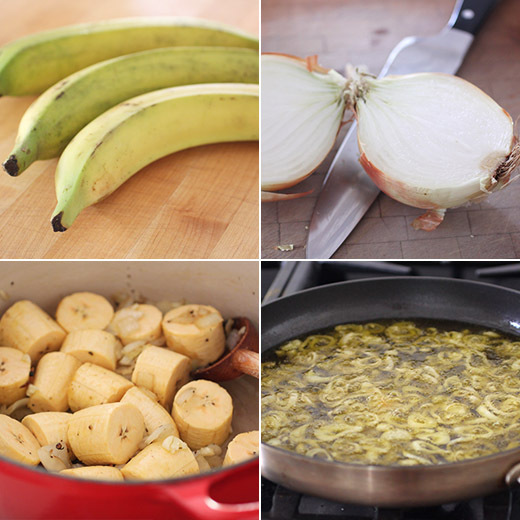 Green plantains were peeled and chopped into large chunks and added along with chicken stock. The soup simmered for about thirty minutes or so until the plantains were very tender. Then, it was ladled into the blender in batches to be pureed. After pureeing, it was returned to the stock pot to rewarm, and lime juice was added. While the soup was cooking, shallots were thinly sliced, dredged in cornstarch, and slowly fried in olive oil. The real trick to frying shallots is to take plenty of time and fry over low heat. You can watch the slices and decide how dark you want them to brown. When ready, the shallots were drained on a paper towel-lined sheet pan and seasoned with salt. 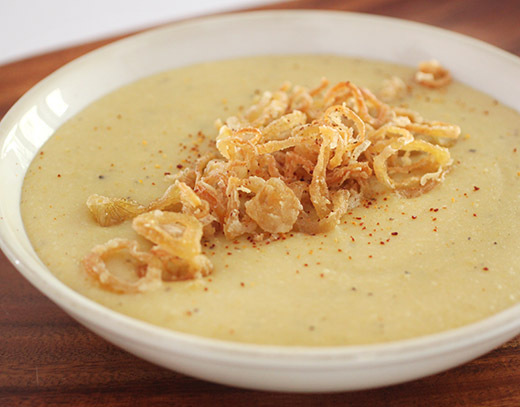 The soup was served with a generous portion of crispy shallots on top. There was no warning in the book, but this soup thickens considerably once it cools. It occurred to me that it was actually a bit like polenta. I added water and whisked to combine to reheat it after refrigerating. But, I thought I might make this again and treat it intentionally more like polenta by letting it become thick. The mild flavor of pureed plantain with the onion, garlic, and lime would be great as a backdrop to a mix of spicy seafood. I have never had plantains this way..so interestingly delicious! Really, really want to visit Cuba. Mrs KR and I need to make that happen. Anyway, fun dish! About the only time I've had plantains was in Cuban restaurants when we lived in Florida. This looks great -- thanks. pureed soups are definitely the way to go! i don't think i've had plantains any way except fried, and i feel like that might not do them justice. i'd like to try this!